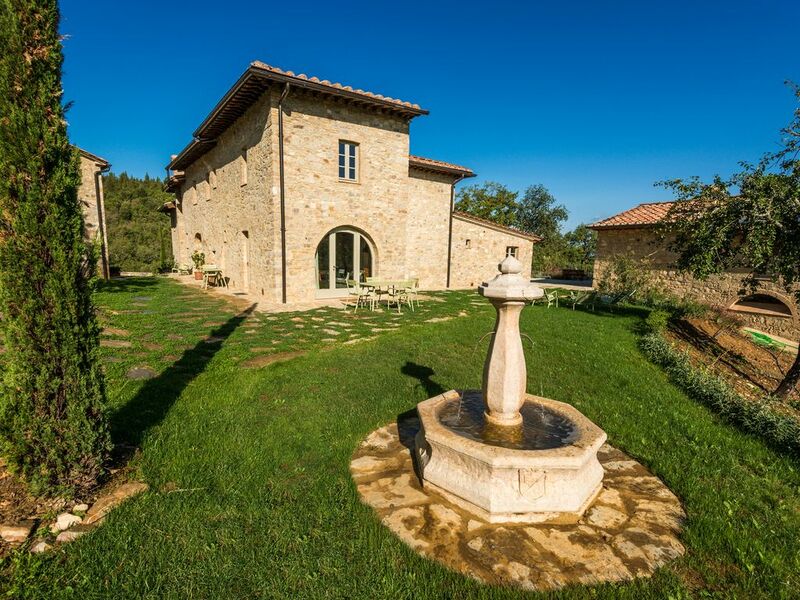 After our priced and beloved villa Casa le Pigne, (43 time honored with a 5 stars review, ref 607748), we have opened a wonderful restored 17th century Podere (Farm) with 4 comfortable 1 and 2 BR apartments and a small house : The Podere LA VALLE. Little house LA TORRE make part of the the Podere LA VALLE. LA TORRE has 2 floors : on the ground floor, a living room with sofa bed and open fire. Separate small but fully equipped kitchen including dishwasher. On the first floor, a nice room with direct access to a private terrace. Separate Bathroom. The Podere offers all you have dreamed on : a large pool, an indoor Spa with jacuzzi, IR sauna, and steam bath, 120ha forest and the Tuscany at your feet. We can accommodate 16 people + in total. Guests have access to the pool (14x6m) from May to October and to the indoor Jacuzzi all the year round. The pool is equipped with a lift for disabled person. A large Library with TV and coffee and tea is also accessible in the shared Lounge. La Torre has antique furnitures, wifi and Floor heating. The 120 ha property gives opportunity for many walks in the forest and discovery of the Tuscan wilderness. Our Podere is 40 minutes away from Florence and 30 min from Siena. The nearest village (Castellina in Chianti) is 6km far. You find there a small supermarket, groceries, wineshops, 3 banks and ATM, and 8 restaurants. High level of comfort in the Countryside. More friends or family ? You can combine 2 or more appartements in the Podere in order to come with relatives or friends or to organize a family event. #FORNO (url : VRBO.com/1226950), 1BR, occupancy 2 to 4. My Name is Jerome GLORIE, i love Tuscany where i come and stay since 40 years. I'm 63y, father of 2 daughters. We grow 2 ha of aromatic plants around the farmhouse, we distillate them and produce essential oils and hydrosols. I live in Brussels, Belgium. The Podere exhale a exciting historical smell : 1000 years ago pilgrims travelled the property and rest in a small "hospital" (visible ruins 300m from the house). In the forest you will see wild boards and roes. Nice views on the Chianti landscape, one of the most beautiful in Europe. The Podere is a jewel in this area. very comfortable accommodation, fit for everybody, from a young couple with kids, family or less fit people. And the Chianti : the famous Chianti Classico wine, the tasteful restaurants (from a bistro to 1 star), the kindness of the people. Filomena keep the Podere and can cook for you (on demand) and will help you the make your journey unforgettable. Podere la Valle have is own agricultural activity: growing aromatics plants We are in one of the best known vineyard area : Chianti Classico. We knew by the photos that the property was going to be amazing. But, when we actually arrived in person we were delighted to find what a truly special place we had found! Pictures and words cannot begin to describe just how incredible our stay was. The home was extremely clean and had everything that we needed. We enjoyed cooking breakfast each morning and eating with a romantic roaring fire. Firewood was included and already prepped for our first use. We pack picnics for lunch and we really appreciated the refrigerator with freezer so we could make a new batch of ice each day. The kitchen is more spacious than it looks in photos so we both able to work well together in the kitchen. The bed is very comfortable and sleeping with the windows open at night was magical. As an interior designer I truly appreciated all the details of the home and even took away some ideas that I would love to recreate. The extensive property was so fun to explore. We started each morning with a hike on one of the many trails right from property. The spa is an absolutely one if a kind feature. Since you can reserve your private time slot you can relax and enjoy your own quiet slice of heaven! Thank you Jerome for creating such a wonderful property to share. We are already planning a return visit with friends! Nous sommes venus avec toute la famille pour profiter du plaisir d'être ensemble avec les 3 générations et le "Podere" s'y prête magnifiquement bien.Les appartements permettent à chaque famille de partager du temps ensemble et aux jeunes de se retrouver entre eux, et la grande salle à manger est géniale pour se retrouver tous. La piscine est assez grande pour héberger tout le monde et les abords sont très soignés pour différentes activités : les ados jouent aux fléchettes et nous faisons des parties de pétanque avec un verre de Chianti à la main. Filomena nous a préparer des petits-déjeuners copieux et plusieurs repas du soir. Nous avons aussi visité la région et Castellina est un point de départ facile pour Sienne, Florence, San Giminiano et Volterra. They told us it was an apartment, but in fact the TORRE this is a separate little "maisonette de charme". The room gives to a private terrace where we spend time to relax, read and eat under the trees. A perfect balance between staying in a multiple apartments resort with a large pool and a spa, and being on our own. Castellina is a very nice village, 6km far away, delicious restaurants and a attracting market on the Saturday. We will come back ! a small house a few meters from the main house. Just what we needed to have some moments together. Die Fewo hat alles was man braucht, sowohl bei Sonnenschein (Pool, Hängematten) als auch bei Regenwetter (Sauna, Kamin). Im Herzen der Toskana sind viele Tagesausflüge zu machen. Die Wohnung ist mit einer Küche ausgestattet, die alles Notwendige hat. Sehr schöne Möbel, tolles Bad, nette Terrasse neben dem oberen Stockwerk. Sehr nette Gastgeber. Eine Oase sondergleichen, die von Menschen kultiviert wird, die ihr Können und ihre Leidenschaft tagtäglich zum Ausdruck bringen. Mille grazie, Herr Glorie, Filomena - und Mirtillo! IR sauna and steam bath all the year round.